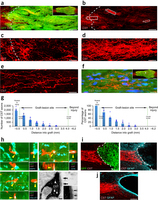 Researchers at University of California, San Diego School of Medicine and Veterans Affairs San Diego Healthcare System, with colleagues in Japan and Wisconsin, report that they have successfully directed stem cell-derived neurons to regenerate lost tissue in damaged corticospinal tracts of rats, resulting in functional benefit. The researchers grafted multipotent neural progenitor cells into sites of spinal cord injury in rats. The stem cells were directed to specifically develop as a spinal cord, and they did so robustly, forming functional synapses that improved forelimb movements in the rats. The feat upends an existing belief that corticospinal neurons lacked internal mechanisms needed for regeneration. Corticospinal axons extensively regenerate into NPC grafts.